Cold-chain development is commonly debated over round table discussions, mostly by business researchers and prospective financiers. The non-inclusion of practical domain experts can tend to make these discussions academic about value chains and the result is a wizardry of numbers. This happens frequently, largely because there are merely a handful of strategic experts who have partaken across the wide range of functions that make the cold chain - it truly is a niche sector! However, the cold-chain is increasingly taking importance as the heart and centre of food security in our future, and such discussions need to move from the rhetoric into the realm of reality. At first, we need to realise that cold-chain as a business is to be approached from the viewpoint of end-to-end supply chain - a value chain comprising a series of logistics activities with associated disturbances and risks. It is not about earning off the infrastructure, but off the product or service that this firm undertakes, with the infrastructure pieces being an enabling tool. Any such business should always start with a broad vision – seen as the vision statement of many well thought out enterprises. The vision is the a future state one wishes to realise, the big picture outcome to aim for! To realise that vision, from dream into reality, the next move is to notify the immediate mission. In executing the mission, a value chain and a value proposal is developed. The mission statement should ideally state the near term primary output being targeted. The mission, consequent and in abidance to the overarching vision, should ideally be revised as per dynamic ground realities. 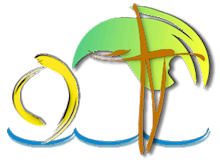 An example of a vision statement is, “Make India the Food Basket of the World”. The conjoined mission statement can be, “To minimise Food Loss by 15%” or... “To build a modern Pack-house in every Village” or... “To build a perishable Food Gateway”... or even all three! The next agenda, in planning a venture, is to understand the enterprises own resources, current and those that need to be developed, which are needed to fulfil the immediate mission undertaken. This is the phase where the strategy is developed and the process of strategic planning initiated. Any good strategy will not be to merely align with the existing value chain (if any), but on how to intelligently disrupt and/or establish value chains anew. Business strategists who do not commence with a target vision or mission will tend to focus on the existing Value Chain system, narrowing their perspective and their strategy on its reconfiguring or reengineering this chain. This will result in only targeting a transactional intervention, and is an approach that will not contribute to long term growth. Value chain can be the measure of a series of activities undertaken, not the mission. 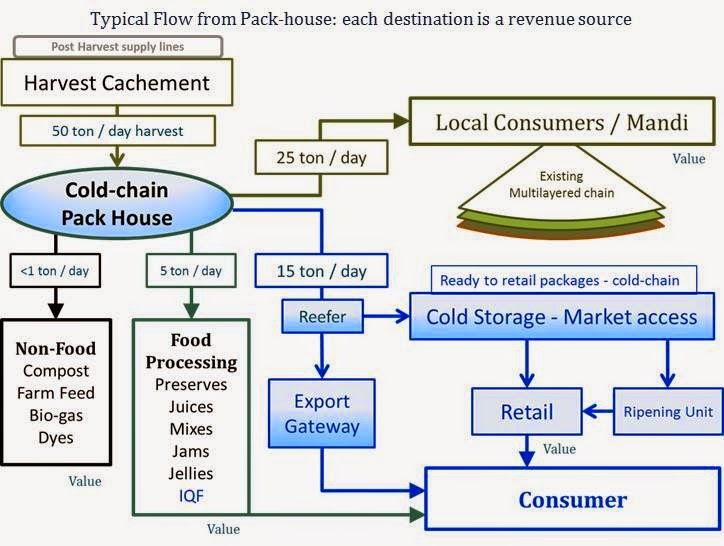 Value chain is a concept that should be well understood by planners. There is a chain of activities across a product’s source to market cycle, and then there is one that internal to a commercial enterprise. The first is the product value chain, also called the value chain system; the latter is the business’s “value chain”. The business’s individual value chain offering is what defines its own value. When a business house has direct ownership of the product’s value chain system, it will capture the most of the resulting realisation. 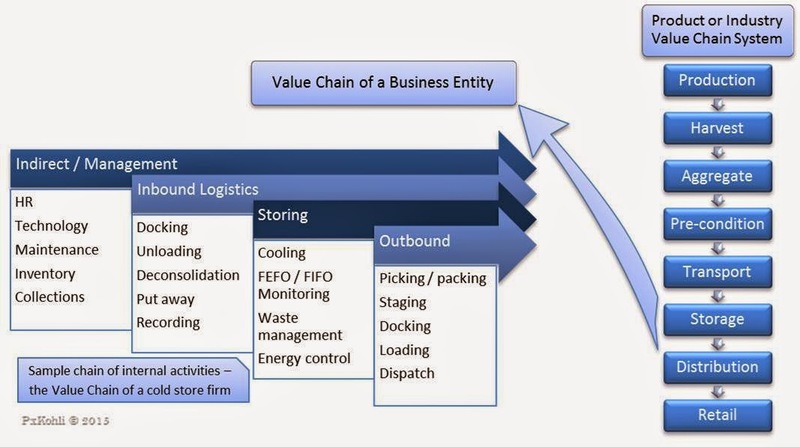 However, the value chain of a business entity is usually a component of the total value chain system, the scope being dependent on its capabilities and expertise. When planning a new business, it is preferable to start with a blank canvas. whereas in case of an existing business, internal value chain analysis is suitable for gainful realignment. The organisation's value chain is a reflection of the current activity exposure of a firm, within the larger system, studied to understand the impact or outcome of specific execution, each transaction within the value having a linked risk and cost. Such assessment or measure of an ongoing activity chain, the value chain, cannot become a starting point or the vision of an enterprise. The final value realisation options, are dependent on multiple variables such as the chains of activities, processes, policies, technology and transactions that endure. This complete current activity chain, is called the value chain. Which can be quantified, is always improved upon, through fresh innovation. Simply put, value chain measures are an on-going assessment, and lend to further options to improving upon the competitive advantage, or to develop win-win value proposals. Reconfiguring a value chain and even strategically extending the scope in the overall value chain system is an exercise in wealth creation. Nevertheless, the value chain itself should not be the starting point of an individual business's plan. The value chain is a quantification of the activities undertaken by a business, and will remain dynamic to change, external and internal. In the course of developing a strategic model for a new business, the enterprise should assess its resources and on available options to strengthen them. This exercise will lead to the developing of tactics to employ on various fronts, such as finance, infrastructure, operations, marketing, etc. These tactics will incur functional costs and generate revenue, which will eventually define their stake in the overall value chain system. The existing value chains can provide hints, but aim should be to develop the firm's value chain afresh. This individual capture of stake, is a business's own measure of its value chain. The business value chain is of course what defines the commercial profitability or the developmental achievements of each enterprise. In the planning phase, the value chain is a notional assessment of activities and it will be a variable result of strategic inputs and tactical outputs. For new business planners, where a commercial model is well defined, the existing value chain system is available to intervene in, but each individual business will have its own space in the chain - a value chain specific to the firm. In planning and executing to achieve a business format, many variables will come into play, and hence tactics need to be dynamic and in turn feed information for strategic course corrections. When a model is collaborative across activities, the overall value chain system is not to be confused with the business's value chain, as the latter is internal and defines the value proposal and individual viability of the business firm alone. Collaboration between other external value chains in the value chain system is also important to success of an enterprise. Such linkage allows a value chain to manage the value chain system of which it is a part, to sustain its competitive advantage. (eg.- OEM car manufacturers control the value chain of component manufacturers). 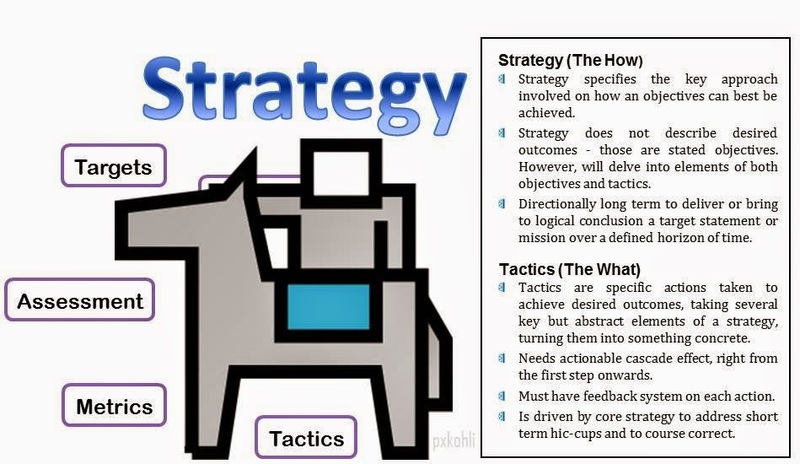 Defining a mission and then understanding the specific chain of activities required, to complete a mission, is a key step in assessing strategic options in the planning stages. This means that if, for example, one has decided to run in a three legged race, then on assessing the resources at hand – two legs only – will define the initial strategic approach. The strategy would be to find a partner, train and build capacity to compete, so as to achieve an honourable position by the end of three years. The tactics would include financing the running shoes, buying the timeshare on the athletic tracks and the right diet, participation in preparatory races and maybe even extend to developing a fall back runner. The mission is to win and the value realisation could be far more than the winning the race itself. The value chain would be the chain of efforts put into these tasks. The success of any cold-chain intervention will similarly depend on setting the mission, the initial resource assessment and those that can subsequently be safely developed, strategic planning and execution. The current capability status will be the precursor to the strategic business interest of each concerned enterprise, and would finally define the scope and extent of their value chain participation. The gain (and risk) is maximised when having solitary participation in all involved activities, and is limited when the total chain of activities is not owned. Any changes in the chain of events in the course of moving towards the vision or mission, will reflect concurrently on its value chain status – if stayed transparent. So, does this apply when you sit to prepare long term strategic business plans? Do you remember the vision or do your only work around your value chain? Can a value chain be the business target?